“Hi, I’ll try and keep this brief, it may go on a bit…but don’t worry, it ends well, nobody dies and you’ll learn something. 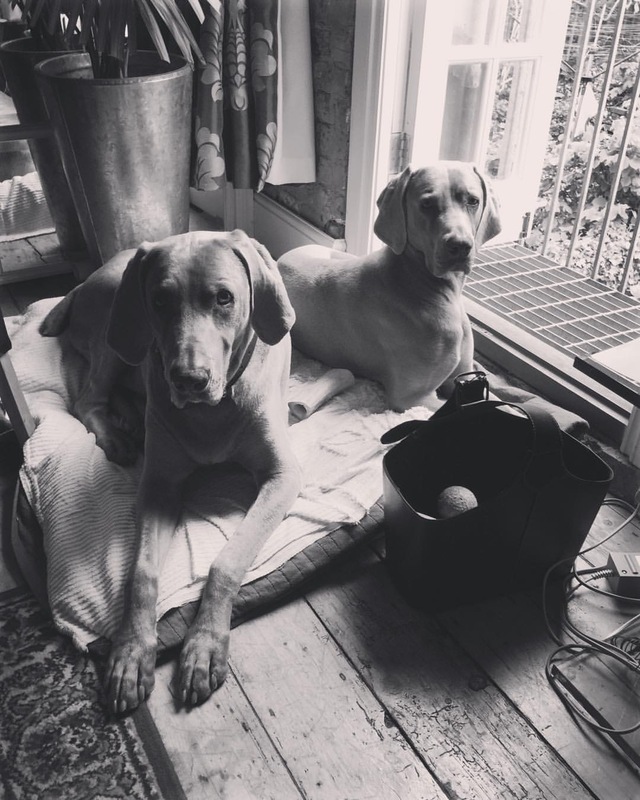 My best friend Luther the Weimaraner reached 10 last year. He’s a HUGE dog, over 50k at one point but always fed and exercised and loved very much. 2015 wasn’t great for Luther, prostate removal, stomach problems and then the diagnosis that he was very arthritic. I was devastated, not least because I hadn’t noticed the change in him because we’re together all the time. So, the plan…drugs? Therapy? I trust my vet and we tried Metacam that made him ill, moved onto TRAMADOL !! That wiped him out, he couldn’t make the stairs (we have a four floor townhouse), he wouldn’t eat and last November I had to keep going into other rooms to cry about losing him so he didn’t pick up on the vibe – you know that sounds strange to some people, but when you bond with another life, you bond. I went back to my vet who I’ve had for over 20 years to discuss Luther’s options, even if that meant euthanasia. 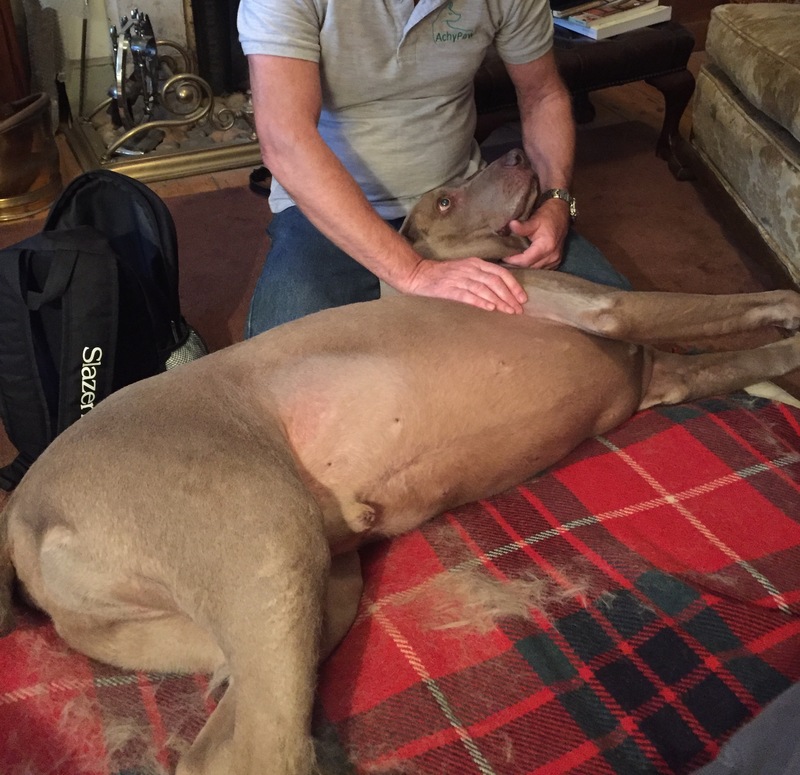 He said, “I know you’ll think this ridiculous but I know a guy who’s a qualified dog masseur…and don’t roll your eyes!” So I’m there, I’ve dabbled with massage, acupuncture, reflexology & feng shui, what did I have to lose? My best friend. So I called Dr Les Ellam kind of reluctantly. I mean I’m a realist, and the thought of paying to have my dog massaged…. But the universe gives you what you need – I’d known Dr Les for about twenty years, four times a week at the gym. He was a Dr at Brighton or Sussex Uni, and had helped me with some research for my job as a journalist but the gym closed and we had lost touch. So I decided to give him a go, Luther was in a bad way. Took a few minutes, but from the first 6 weekly sessions, Luther wanted to eat again, go out, and didn’t need the tramadol !!!! Les showed us how to learn his techniques and use them between visits. As Luther got better, Les suggested once a month but I see Luther gets wobbly after about a fortnight. I cannot praise highly enough the service Luther has received, he has been given back to us. Maybe not for years, but at least being a giant 11year old dog with arthritis isn’t an unhappy life thanks to Achypaw. Also impressive, is the way Dr Les shows you how to do the work, it’s not a situation where you can’t help your pet unless you hire him. My insurance paid for 15 sessions and they’ve been worth every penny. AchyPaw prolonged and increased the quality of Luther’s twilight years. If I hadn’t seen it myself I would never have believed it.